I admit I saw the movie adaptation first and therefore nothing in the book really came as a surprise. I remembered I liked the movie, so when I found an edition with this story and another, The Langoliers, I bought it. 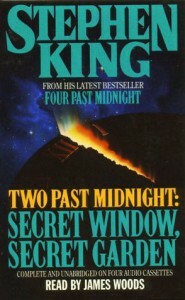 Previously I'd only read the very long stories by Stephen King, and in that respect this cost some time to get used to. The story bottles down to a writer being plagued by a man who claims he's plagiarized his work. It was an enjoyable story, but not the best King I've read. The length seemed somewhat of, like it should have either been shorter or a full length (though not 800 page) novel. That doesn't mean I'm not glad I read it! Note: I read a Dutch translation of this book.